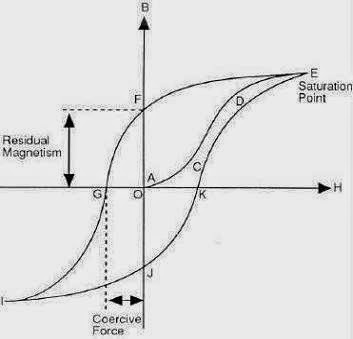 Need of DC and AC Biasing: We have studied Hysteresis curve for magnetic materials which shows that the curve (characteristic) is non linear. While recording and reproduction, the magnetic tape passes through the hysteresis curve. The magnetizing force (H) is determined by the number of turns on the head winding, current through it, produced magnetism (B) and the induced magnetization in the tape. When a particle on the magnetic tape comes across the head gap, it is magnetized upto E (Figure). When the particle leaves the head, though there is no magnetizing force (H) on it, even it has some magnetism called residual magnetism (OF in the figure). This residual magnetism leads to distortions. Therefore, a technique is used during recording, reproduction and erasing, which makes the above operations only in the linear region of the hysterists curve, which makes the operations free of distortions and noise. This explains the need of biasing, for which Biasing oscillators are used. Biasing is of two types: DC Biasing and AC Biasing. 1.DC Biasing: This is done by adding a constant direct current (DC) to the audio signal to be processed and is operated in the linear region of hysteresis curve. This gives a distortion free output. 1.It improves the quality of the reproduced signal. 2.Output is free of distortions. 1.Enough dc bias is required for getting desired results. 2.The amplitude of the signal that can be processed is small. 3. The tape remains magnetized due to dc bias, even there is no audio signal. This produces a continuous hissing sound during replay. 2.AC Biasing: In this, high frequency alternating currents (AC) of the order of 100 KHz is added to the audio signal. The output is obtained on both sides of the magnetizing curve. It is also be noted that the recording signal and the high AC bias are simply added without any modulation and the frequency of the pure sinusoidal ac bias voltage should be about four times the highest frequenct to be recorded. 1.Higher audio signals can be recorded. 1.Distortion is increased, if the bias is low. 2.If the bias is higher, high frequencies are erased from the tape. 1. Here a constant DC is added to the audio signal to be processed. 1. Here high frequency AC of the order of 100 KHz. 2. It is operated in the linear region of hysteresis curve. 2. It is operated on both sides of the magnetizing curve. 3. The amplitude of the signal to ber processed is small. 3. Higher audio signals can be recorded. 4. The output is free of distortion. 4. Distortion increases if the bias is low. 5. Signal to noise ratio is small (25 db). 5. Signal to noise ratio is large (60 dB). Ihave a seminar on AC biasing. So I would like to know more about it.would you pls help me?